Last year, Republicans passed a budget that cut about $30 million from the state’s career and technical education program (also referred to as Joint Technical Education Districts.) These programs provide training that helps prepare both students and adults for high-wage careers, which contribute to the state’s economic stability and show a significant return on investment. House Democrats have called for this funding to be restored and now iamCTE.org, an online career and technical education program advocacy group, is working to show other Arizona legislators and Gov. Ducey how vital these programs are to the economy and encourage them to restore funding. The group is circulating a petition to save CTE funding in Arizona. The goal is to get 5,000 signaturesto demonstrate support for this training. These programs create an education environment that integrates solid academics with real-world relevance. High school students involved in CTE programs perform better and graduate at higher rates, with training that will translate to the workforce. But these programs also benefit college students and adults. Research shows that skilled trades are some of the hardest jobs to fill in the country. CTE helps train people for work in these industries while closing the skills gap. 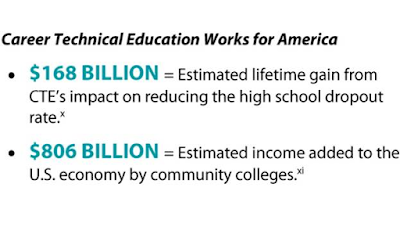 CTE restoration funding is a critical investment for Arizona’s workforce development. It is a clear investment in Arizona’s students, economy and future. #AskDuceyWhy he and other Republicans have jeopardized Arizona’s future by slashing the budget for career and technical education.